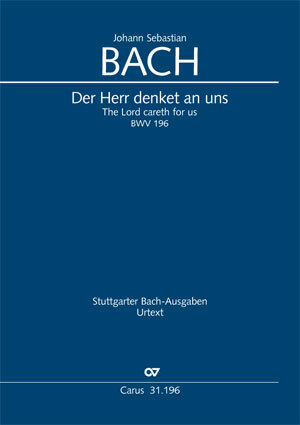 Especially due to the early date of its composition, from the pen of the just turned 22-year-old Johann Sebastian Bach, the cantata "The Lord careth for us" BWV 196 has its charm, and through its conciseness, as well as its simple scoring, it is quite accessible for performance by ensembles with only modest means. The cantata was composed on the occasion of a wedding in the 1797/08, the details of which cannot be exactly ascertained. The text of the libretto contains no freely written poetry, rather is drawn solely from the Bible (Psalm 115:12–13), there are no recitatives, and the arias are kept very short. The scoring is also of modest propoportions: In addtion to the solo voices soprano, tenor and bass, as well as a four-voice choir, only strings and basso continuo are requried. The cantata begins, as is typical early Bach cantatas, with a short instrumental sinfonia and ends, not with a chorale, but with a choral movement.